Vice President Lyndon B. Johnson. Kennedy mainly consulted his fifty-four year-old vice president during the crisis about the mood in Congress. Secretary of State Dean Rusk. A fifty-three year-old former Rhodes scholar and lawyer by training, Rusk initially favored an air strike against the missile installations in Cuba. Secretary of Defense Robert McNamara. The forty-six year-old former president of Ford Motor Company became an early, strong advocate of the blockade. Secretary of the Treasury C. Douglas Dillon. The fifty-three year-old Wall Street veteran, who was the lone Republican in Kennedy’s cabinet, initially supported an air attack. Attorney General Robert Kennedy. The president’s brother, just thirty-six at the time, argued for the blockade and participated in many secret meetings with the Soviet ambassador. Director of Central Intelligence Agency John McCone. A sixty year-old former undersecretary of the Air Force, McCone had pushed to fly U-2 reconnaissance missions over Cuba. Undersecretary of State for Economic Affairs George W. Ball. The fifty-two year-old former associate general counsel for the Lend-Lease program promoted a naval blockade. Deputy Secretary of Defense Roswell Gilpatric. The fifty-five year-old former Wall Street lawyer and undersecretary of the Air Force was a strong advocate of the blockade. Chairman of Joint Chiefs of Staff General Maxwell D. Taylor. The sixty-one year-old hero of the World War II invasions of Sicily and Italy initially backed immediate military action. Ambassador-at-Large Llewellyn Thompson. 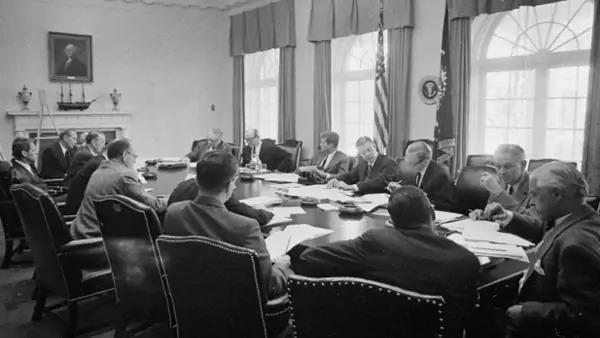 Twice the U.S. ambassador to the Soviet Union, the fifty-eight year-old supported the naval blockade and persuaded Kennedy to accept Khrushchev’s proposal on October 26 while publicly ignoring the section about removing missiles from Turkey. Special Counsel Theodore Sorensen. The president’s thirty-four year-old speechwriter advocated the naval blockade as the first response. Special Assistant to the President for National Security Affairs McGeorge Bundy. 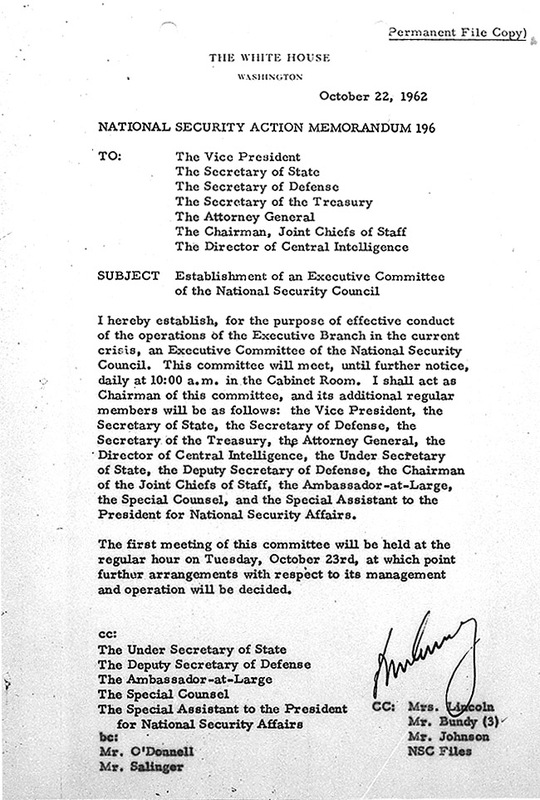 The forty-three year-old former Harvard dean supported an air strike and took the minutes of the ExCom meetings.